We’re often asked to post more recipes but Mary and I are not good at whipping up original delectable creations. I’m often jealous of Mary because her husband, James, is amazing in the kitchen (check out his recipes here and here on Against all Grain and here on Primal Palate) but lately I’ve enjoyed getting back into the kitchen and finding recipes that actually work. That’s what sparked this series! Instead of attempting to create lame (or ultra basic) recipes to share – we thought we’d begin by reviewing existing recipes on other blogs! As I started cooking more about two weeks ago, I realized that many healthy recipes look amazing in pictures but don’t necessarily taste that great when you actually make it. We’ll aim at reviewing the really amazing recipes instead of ripping on the bad ones. The first round-up of amazing reviews falls along the theme of “grain-free comfort foods!” Enjoy. Images correspond with the list below and will go left to right, by row. Against All Grain’s Caramel Glazed Doughnuts (grain and nut free) : I made these one evening using a mini doughnut maker machine. Before you make this recipe…you need to realize that these don’t taste like Krispy Kreme. I say that because that’s what I had in mind (which is pathetic). They ended up tasting like really delicious grain free cakes (shaped like doughnuts). The glaze added a nice sweet touch but next time I think I will just smear peanut butter on top before popping one into my mouth. The glaze made the doughnuts rather soggy the next day. Perhaps I should have refrigerated them! This takes awhile to prep, make and glaze so I’d suggested making these as a fun activity. Banana Peanut Butter “ice cream” (grain and dairy free) : This is my new favorite dessert! I don’t have a link to a recipe but I just placed 2 frozen bananas into my food processor and set to high while adding in a bit of coconut milk until the consistency is like ice cream. Then I added a dollop of peanut butter (probably 1/4 cup). Add any nut butter if you can’t have PB! It literally takes about 5 minutes to whip up. Zest Bakery’s Grain-Free Tortillas (Paleo) : I made tacos for my sister earlier this month and used this recipe. These tortillas really do hold up and look as pretty as the pictures! They are, however, very egg-y. I hate eggs so I really didn’t enjoy the taste. This is also a very easy recipe and doesn’t take long at all. Cappello’s grain-free Fettuccine with gluten-free Alfredo sauce: I ordered Cappello’s Fettuccine (it cooks in 45 seconds!) and whipped up this homemade Alfredo sauce recipe. So rich and creamy. Tastes just like the real thing. 3-Cheese Ravioli using Cappello’s lasagna sheets : I used this recipe to create the filling for the ravioli. It wasn’t a super quick meal but MAN was it delicious. Luckily my parents had one of those rollers so it wasn’t too hard to make them by hand. Boil for about 3-5 minutes. (Ravioli continued) Add whatever sauce you want! I used leftover Alfredo and sprinkled with parm. These Dang Coconut Chips are delicious. They contain cane sugar but for one serving you’re getting 8g of sugar. Not a recipe but I’m vouching for them. A Couple Cook’s Sweet Potato and Feta skillet : SO delicious but I did make some tweaks. I used the food processor to shred the sweet potatoes and didn’t have chard. I also added the leftover ravioli filling (ricotta, parm, asiago blend) and added dollops onto the skillet towards the end. 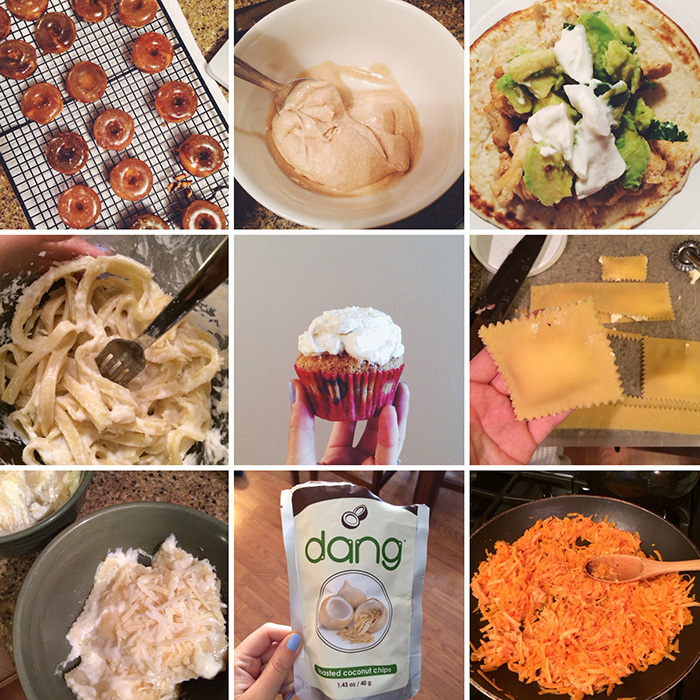 As you can see, I incorporated Cappello’s grain-free pasta into many of my meals last week. I didn’t want to freeze them or let them go bad. It’s definitely an investment but a nice treat every once in awhile. Each package feeds two people and I ordered the sampler. This isn’t sponsored! Just excited to share about grain-free pasta that actually tastes real! Hope that inspires you to try some new recipes! Excited about this new series. SO smart to use the lasagna sheets to make ravioli!! Totally trying that. Cappello’s is just the best, isn’t it?